Mathematics: This week we have begun to learn about division, the division symbol, word problems and vocabulary related to division situations. Please discuss with your child some sharing mathematics problems and talk about the inverse/opposite relationship division has with multiplication. 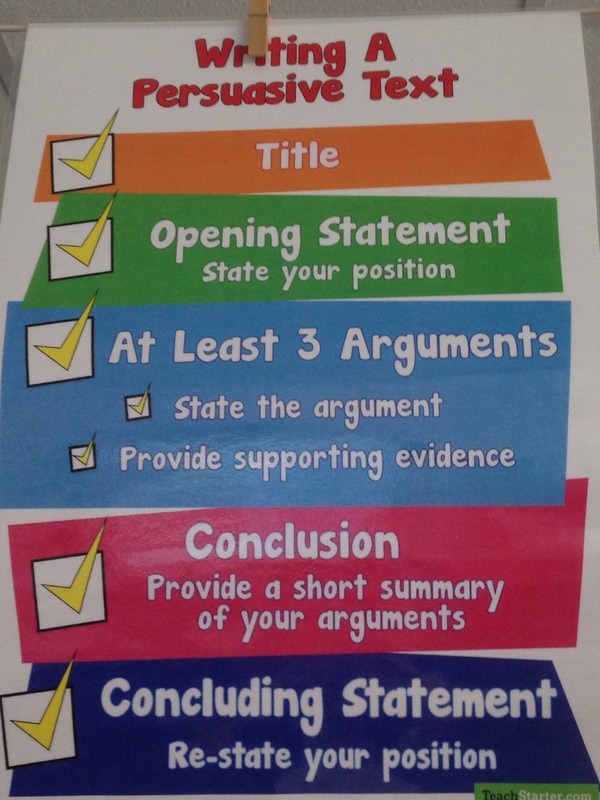 Writing: We continue to develop our understanding of the structure and text features of persuasive texts. 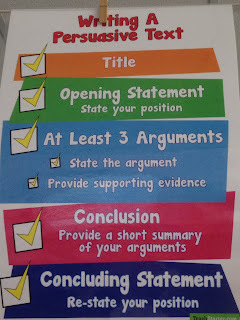 We have begun to apply our knowledge of reasons and arguments and are learning how to expand each reason by explaining in detail so that our reader is able to imagine and will be likely to be convinced or persuaded to agree with our point of view. 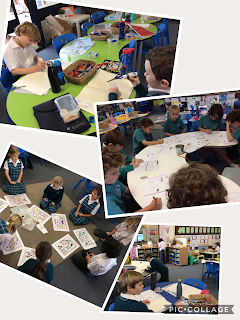 We were very tired but proud writers yesterday as we learnt how to use a planner with our ideas to create real paragraphs and structure a complete persuasive texts correctly. How would you convince others to eat all their vegetables? Do you think a class pet tiger is or isn't a good idea? What is the best season in Dunsborough? Reading: We are loving our #classroombookaday challenge and finding some picture book gems along the way. The benefits of a daily read-aloud is being seen already and the books are proving very popular during Read-to-Self times. We are loving noticing and discussing some interesting and new vocabulary too! Our Guided Reading groups are continuing this term with each group learning how to search texts to find evidence and answer literal questions. Students are becoming text detective champions! Year 2 Prayer Assembly: In just over a week, both Year 2 classes will be presenting a prayer assembly on Friday morning, 10th August. The theme is God's love and our empowerment to love in relation to the Sacrament of Confirmation. We have been busy learning some Auslan signs to sing a song about God's family and love. Some Year 2s have also volunteered to read and has brought home some lines to practise. No costumes or props needed for the assembly and we would love you to come join us at 9am next week if you can. Feast Day Mission Markets: This exciting annual event will be on Wednesday 15th August. After a school mass at the church, the whole school participates in the mission markets. Our class will be running a Guess the Number of Jellybeans stall and so ask for each family to donate one large or two regular sized bags of jellybeans over the next weeks so that we can organise the stall with as many jars as possible. I'm sure the kids can't wait to visit all of the other exciting stalls and assist collecting money and recording the guesses. It's also a great opportunity to apply our maths skills to real contexts and we just love collecting and organising data in 2K! 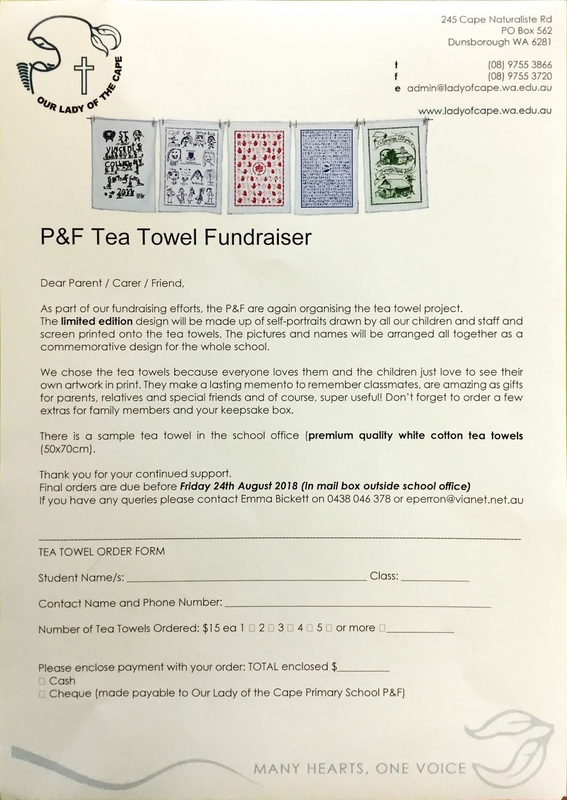 Tea Towel Fundraiser. 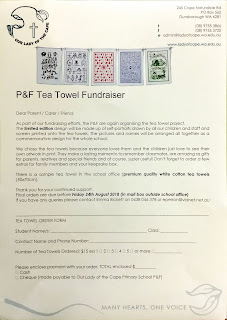 Below is the note that was sent home last week about the annual Tea Towel Fundraiser. This is not compulsory but if you would like to order one, they need to be ordered by Friday August 24th. Seesaw: We now have Seesaw up and running in 2K with 10 connected families so far! 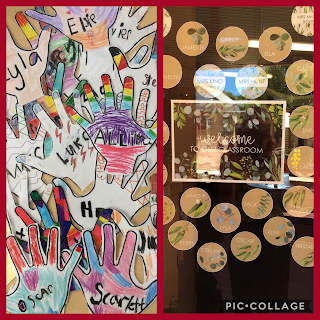 This is an web-based learning journal where our 2K team can share their learning and classroom activities with their parents. It is not an app where students need to do anything at home - it is just a great opportunity for our students to record their learning in an online learning journal or portfolio. 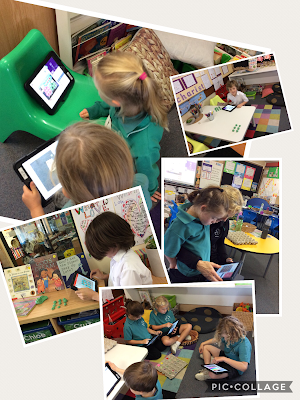 It is also a great way for Mums and Dads to be able to see some day-to-day learning that happens in our classroom. 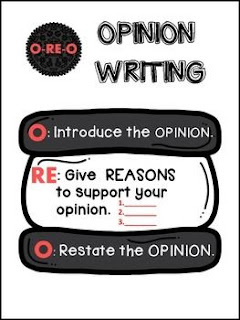 You are also welcome to leave comments for your children to read and 'like' their journal entries. Please see Mrs King if you are having trouble with access to the app or difficulty joining to your child's journal using the note sent home that has a direct link with your child's Seesaw with the individual QRcode. Make sure when you load the Seesaw Family app (not Seesaw Class) that you also turn on notification ON so that you know when a new entry/item is uploaded by your child. Please also be aware that I have an open-door policy and you are more than welcome to come and view your child's work or workbooks. The children have also requested to bring back the 'Best Work Board' again this term so you may notice different work displayed next to their peers and the work changing at different rates. This work was chosen by your child and different samples may have been chosen by them to be glued into their books instead of displayed. Some are more confident than others with displaying their work (in particular writing). I have found it quite interesting when asking children why they prefer or are proud of certain work and their responses show good self-reflection about their learning and how their choice often relates to a personal learning goal. This self-reflection and reasoning is a wonderful learning trait we wish to develop for future growth. It is also a great opportunity to talk about each others differences, talents, strengths and also weaknesses that we need to work hard and persist with. We talk about the different things we find difficult and those things we find easy (or have practised to develop) and why God made us this way. We are all unique and we celebrate our differences and what makes us special in 2K. Welcome to Year 2K 2019!!!! What a first week we had! We all had a busy yet fun time learning new routines, rules, ways to learn and new things about being a big Year 2 student. Most importantly, we have gotten to know each other more and have worked hard to build our 2K team together. In Mathematics we have begun to review the place value of 2 digit numbers and building upon our learning of the parts of numbers in the hundreds and thousands. We also began our weekly problem solving task and using data to create a whole class birthday graph to determine which month in our class was the most popular to celebrate a birthday. Below are a few messages about key events and information that we would like to share with you before our Parent Information Evening next week (Tue 19th Feb). The time of the meeting is TBA. I am so pleased to say that our first two days of swimming have been a huge success! We have managed to come to school prepared, work hard in the morning, eat and swim like super speedy champions, all before coming back and finishing the school day for the last half an hour. The students have been very responsible with their belongings, making good choices and decisions about what to eat at recess and lunch break and have been showing their best OLC values while at the pool. I'm so proud of them and their effort to 'just keep swimming' through our double lesson days. I'm sure they will be sleeping well over the next few nights! I'll send through a blog post early next week of all of the learning too. 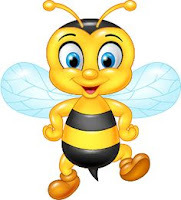 While it is only 15 days of school left for the gorgeous students of the 2K team, we are still busy as bees!!!! Homework - Home readers from OLC will continue until the end of this week and then I will begin to collect up the books to determine what is missing starting next week. I hope that the students will remain reading their own books and local library books every night and encourage them to write in the titles in their RED reading log until the end of term. The Think Mentals books have been completed and will be sent home soon. Please let me know if you would like your child to continue with maths homework for the remainder of the year and I can supply a supplementary number Mathletics booklet. Spelling will continue for the remainder of the year with an new list each Monday - please continue using the look, cover, write and check books each night.